Mary Oliver has been writing poetry for nearly five decades, and in that time she has become America's foremost poetic voice on our experience of the physical world. This collection presents forty-seven new poems, all written within the last two years, and each exhibiting the power and grace that have become the hallmarks of Oliver's work. On the eve of the publication of her third volume of poems, Twelve Moons, Archibald MacLeish wrote to Mary Oliver: "You have indeed entered the kingdom. You have done something better than create your own world: you have discovered the world we all live in and do not see and cannot feel." In the twenty-five years since, Mary Oliver has published nine more volumes of poetry, each revealing new aspects of our world, inviting us to pause with her and to see and feel them. In this new volume she demonstrates, perhaps more affectionately than ever before, "what it means to be human and what is worthwhile about life,"* or, more simply, why the poet wakes early. 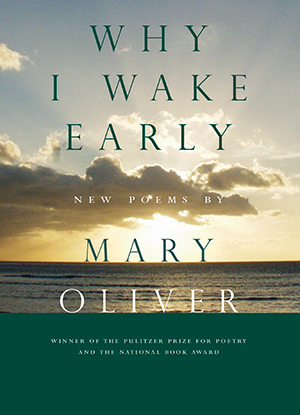 Mary Oliver, winner of numerous prizes, is one of the most celebrated and best-selling poets in America. Her poetry books include Owls and Other Fantasies; House of Light; New and Selected Poems, Volume One; Dream Work; White Pine; West Wind, The Leaf and the Cloud; and What Do We Know. She has also published five books of prose, including Blue Pastures, Rules for the Dance, Winter Hours, and, most recently, Long Life. She lives in Provincetown, Massachusetts. Nature demanded its due on Sunday afternoon, as clocks pushed forward for daylight saving time provided an extra hour of sunlight to observe debris strewn by the ferocious windstorm on Saturday night. The New Amsterdam Singers seemed to have planned in advance with “As Nature Wakes,” an enjoyable mix of American and Czech works featuring nature as subject or metaphor, presented that afternoon at the Church of the Holy Trinity. This adventurous amateur chorus, founded by the conductor Clara Longstreth in 1968, celebrated its 40th anniversary with the New York premiere of Ronald Perera’s “Why I Wake Early,” jointly commissioned by it and the Chatham Chorale of Cape Cod, Mass. Mr. Perera set eight poems by Mary Oliver, a Cape Cod poet, for mixed chorus, string quartet and piano. Ms. Oliver’s poetry, which has drawn comparisons to the work of Emerson and Thoreau, reveals an awestruck regard of nature that verges on the religious: “What wretchedness, to believe only in what can be proven,” she writes in “I Looked Up,” the fifth poem in Mr. Perera’s cycle. Her work also demonstrates a discerning eye and an ability to render vivid images with a few deft strokes. Mr. Perera sensitively underscores both attributes in a cycle spanning a day from one dawn to the next, linked by a subtle, recurring four-note motif. His music neatly conjures Ms. Oliver’s rippling pond, wary crows, flitting bats and lazily unspooling snake. At the same time, the work’s dramatic progression, from the shivering anticipation of “Morning at Great Pond” to the radiant affirmation of the concluding title poem, “Why I Wake Early,” does justice to the poet’s more transcendental intents. Enhanced by Mr. Perera’s estimable knack for setting English, this is a substantial addition to the choral canon. Ms. Longstreth’s vocalists acquitted themselves honorably in Mr. Perera’s work, singing with secure intonation and smooth blend. The Lark Chamber Artists, a flexible ensemble recently formed by members of the Lark Quartet, provided lively, nuanced accompaniment and played vivaciously in two movements from Dvorak’s Piano Quintet in A. The chorus sounded fine in two deftly scored works by Matthew Harris, “Love Songs” and “Innocence and Experience.” Its execution was more variable during works by Dvorak, Barber, Petr Eben and Jiri Laburda, most of which would have benefited from cleaner attacks and more sharply defined rhythms.